Pingvellir (trans: "Thing Fields") in southwestern Iceland is where American and Eurasian tectonic plates collide, forming a gorgeous rift valley that grows larger by the day. It is an apt metaphor for not only neutral Iceland -- a psychological battleground between Allied and Axis forces until the British invasion of May 1940 -- but for the intimate, charming Reykjavik International Film Festival (RIFF), which just completed its 11th year. Like the still-active Holuhraun volcano -- the 4th Icelandic volcano to erupt in the last four years, its poisonous gases stemming the tourons that, as the 2013 documentary Ash illuminated, callously streamed in to viddy the 2010 Eyjafjallajokull eruption -- this continental divide can induce cultural stress points as well. This was manifested last Wednesday at the University of Iceland's Main Hall in a Q & A with 2014 RIFF guest of honor, British film director Mike Leigh (Topsy-Turvy, Secrets and Lies), whose latest film, Mr. Turner, screened at the 11-day fest. In a cantankerous answer to an innocuous question about the role of film schools in the movie biz, Mr. Leigh indignantly replied that "there is Hollywood and there is European independent cinema, and never the twain shall meet." His Chuffness added that film schools are a "rich kid in America problem." And that "film does not mean Hollywood." Did the local Diageo rep, Soley Kristjansdottir, forget to pour Gordon's into Mr. Leigh's tea? Talk Cinema's Harlan Jacobson (learned co-editor of Film Comment) -- who moderated the Q & A and who considers himself a friend of the testy auteur -- revealed that in public Leigh's Socialist instincts get the better of him, but in private he's a gent. Nevertheless, such trite caricatures are disappointing coming from a mature talent, whom one hopes had transcended the cheap adolescent Yank-bashing so characteristic of many of his countrymen. The silver screen lining in Leigh's appearance, of course, is that it highlights how strenuously RIFF strives to avoid the equally boorish celebrity worship that infects other European festivals (from Berlin to Venice to Cannes). This was confirmed by Hrönn Marinósdóttir, the highly capable black-clad festival director frequently spied on her black bike whizzing around the 101 (Icelanders' term for the 9,000-strong Reykjavik city center). As Marinósdóttir informed me at Restaurant MAR overlooking the old harbor, RIFF's "cultural strategy" is to display gutsy indie filmmakers who reflect the "young, innovative and authentic" feeling of Reykjavik itself. The uncompromising Mr. Leigh not only personifies that spirit in his very mien, but, as a late night conversation with Leigh groupies confirmed, he's also an inspiration to young filmmakers seeking to follow in his fiercely original footsteps. Indeed, from Hylnur Palmason's evocative Seven Boats to Lisandro Alonso's shaggy-dog Jauja (set in otherworldly Patagonia -- the Iceland of South America --and featuring Denmark's Viggo Mortensen speaking in Spanish), there were many filmmakers at RIFF taking their beleaguered art form -- whose death has oft been proclaimed in this the "Golden Age of Television" -- in bold new directions. 70% of this year's RIFF films were European, though there was a concerted openness to American works, right down to RIFF's Talent Lab. In fact, this year's Lab included several LA filmmakers - two reside near my Monk Space HQ - as well as SF-based Arpita Kumar (Indian-American director of the slyly patriotic short, My Dear Americans, and wife of Apple Siri cofounder Vineet Khosla, who gently disabused me of all shibboleths surrounding iPhone 6). Such easy cross-cultural conviviality is the refreshing hallmark of this historic East-West meeting ground, which previously hosted the 1986 Reagan-Gorbachev Summit and the Fischer-Spassky "match of the century" (the Edward Zwick movie of which, Pawn Sacrifice, was partially filmed in Iceland). Moreover, because of the friendly village-like feel of the 101, and RIFF's manageable pace and scale, one gets to hang with industry luminaries one might never meet at sprawling mob scenes like Sundance. For example, on my ride in from the Keflavik International Airport (KEF), I discussed the top films of 2014 with Helga Stephenson (Chef de la direction of the Academy of Canadian Cinema & TV, and former head of the Toronto International Film Festival) and Chris McDonald, President of Hot Docs (which, even after our chat, will no doubt reject my Crotty's Kids a second time). Moreover, on the bus ride back to KEF via the overpriced Blue Lagoon, I grilled Variety's erudite film critic, Peter Debruge, whose fascination with Glu Mobile's Kim Kardashian: Hollywood was a revelation. Finally, on the Icelandair flight home, I conversed with Jack Tewksbury, the spry 89-year-old forner executive producer of the Hollywood Foreign Press Association's Golden Globes Show. Really, seriously, how do you beat all that? This easy, hospitable atmosphere is also apparent in other aspects of Reykjavik, from the hip Laundromat Café - whose wild Icelandic salmon is a must -- to the front desk help at the handsomely appointed, family-owned Hotel Holt, which contains Iceland's largest private art collection, including works by masters Kjarval and Sveinsson. The Holt also showcases the sharply drawn Simpsons episode on Iceland, "The Saga of Carl," in a continual loop on its in-house TV channel. Indeed, wherever one travels in Reykjavik absent is the stereotypical sniping one often hears in other European capitals (as if any random American is responsible for NSA spying, Gitmo or George W. Bush's ill-fated Iraq War). Instead, you find a festival and city that awoke from the 2008 global recession -- precipitated, in part, by Iceland's intrepid DIY Viking confidence, as eloquently documented in Michael Lewis' Boomerang -- profoundly aware that its fragile economic existence depends upon courting American filmmakers and tourists with the inclination and wherewithal to visit culturally significant events like RIFF. However, there is more to RIFF than engaging locals. It's the festival's out-of-the-film-box events that really set it apart. In past years, these have included screenings at geothermal swimming pools, as well as premieres at Harpa, the city's architecturally stunning new concert hall (the largest in Scandinavia). This year's events included a visit to local special effects concern RVX Studios (whose cofounder/creative director, Dadi Einarsson, was on Gravity's Oscar-winning animation team while at London's Framestore). In addition, after an intriguing -- some, like Council of Birds producer Viktoria Stolpe, would say revolting -- BSI Bus Terminal dinner of de-brained sheep's head, mashed potatoes and pureed squash (Icelanders also eat horse, mink whale and puffin), we were transported to the eccentric redoubt (allegedly where Bjork birthed a child) of director Hrafn "Raven" Gunnlaugsson (When the Raven Flies). 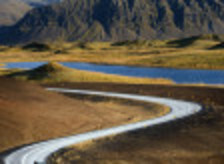 RIFF's "Industry Days" concluded with a nine-hour scouting trip to Iceland's "otherworldly" glaciers, lava fields and waterfalls, courtesy of production company Saga Film (which helped with shoots for Game of Thrones and The Secret Life of Walter Mitty). Whether you are looking to write, scout or shoot (the Icelandic Film Centre offers a 20% rebate if you meet certain "cultural criteria"), put Reykjavik and RIFF in your filmmaking bucket list. However, avoid my mistake, and book early to save on hotel and plane fares. Because Iceland is not in the Eurozone, its krona is comparatively devalued compared to the US dollar. This makes for a relatively inexpensive visit to the literate "Land of Fire and Ice," where the local "parking warden" is likely to be conversant in the films of David Lynch, let alone those of Mike Leigh.